What’s one thing you can do to significantly impact your chance of success? Practice more Empathy. Empathy is no longer looked at as just a soft skill, but something that is increasingly necessary for leaders and managers to increase their effectiveness and drive high performance from their teams. For many people, they believe that Empathy is like Sympathy, but there is a very distinct difference. Empathy is the ability to sit in someone else’s seat and look at the world from their perspective. It’s very different than sympathy which is feeling for them, sharing in their pain. Empathy allows you to get a different view of the world and can make your product, services, and your own brand better when people feel like you can relate. No one has an objective review of reality, we all look at it through our own lens, so making sure we are looking at it from different perspectives becomes increasingly important to ensure the long-term success of our products and services. Many business leaders and entrepreneurs focus on figuring out their own pain or problems, solving for them and then selling the solution to everyone else. That approach to new products and services works for anyone else who has the same pain. Where it creates a limitation is when they aren’t listening and gauging the consumer or their client on the real problems they should be solving for. To instill confidence in clients for the long term, you do not always have to be the smartest person in the room, you need to care the most. Focus on making your customer, your employee, or whoever you are working with the hero and not yourself or your ideas. How do we help them solve the problems they have so they become the hero? Many people see empathy as an innate skill that either you have, or you don’t. 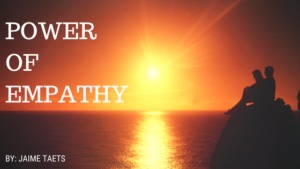 I agree that while some people have empathy as a super power, I also believe we all have the ability to strengthen our empathy muscles whether it is a natural super power or not. Sometimes it takes slowing down and really listening – as Stephen Covey taught us – “seek first to understand and then to be understood” in his book 7 Habits of Highly Effective People. I want to challenge you to think about how strong your empathy muscle is and how you can exercise it more. That might mean finding someone you trust who has it as a strength to mentor and coach you along the way or it might mean taking time for quiet reflection and making sure you are building it into new projects, services or customer engagements. The more you practice it, the stronger the empathy muscle will get, and I strongly believe that empathy is the catalyst for driving change in our businesses, communities and our lives. Keystone Group International is a strategy and growth-focused consulting firm. They offer leadership training and development services focused on the balance of culture and profits to ensure that the organization can grow and scale while maintaining a healthy culture. Check out our services and our SuperPower Success podcast – available on iTunes and streaming live on our website: www.KeystoneGroupIntl.com.